Researchers have found 31 regions on the genome that associate with biological indicators of common diseases such as cardiovascular disease and type II diabetes. These results may provide valuable insights into the biological processes of common and often fatal diseases. The team studied genetic variation in Finnish population samples and identified 31 regions of the genome that regulate metabolite levels. Many of these metabolites act as biological markers in the body for common disorders. This was the largest study of its kind with 8330 individuals from six population-based cohorts taking part and 7.7 million genomic markers studied. Metabolites are small molecules that take part in various chemical reactions in the human body. They play a key role in many biological pathways and often contribute to the risk of many diseases, particularly disorders of the metabolic and cardiovascular systems. They can be used to identify a cell population, make a diagnosis, and measure the progress of disease or the effects of treatment. General clinical testing can only monitor a few circulating metabolites. 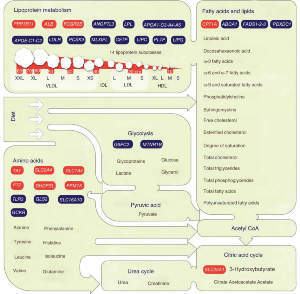 Of the 31 genetic regions the team found to be associated with levels of the metabolites, 11 had never been associated with any metabolic function. Also, two of the regions were well-established indicators for cardiovascular disease and five of the regions were affecting recently discovered amino acids that are potential biomarkers for type 2 diabetes. The team found also that the metabolic measures reported here show higher heritability than comparable clinically used serum metabolites. They accomplished this by comparing the metabolite levels in 561 identical and fraternal twin pair. They saw that the identified genetic markers explained a greater component of the heritability than typically reported for clinically used measures. These results suggest that the studied metabolites are describing better the underlying biology than the routinely used laboratory tests. Study has been supported by grants from the Academy of Finland, EU FP7 Program, Sigrid Juselius Foundation, Finnish Foundation for Cardiovascular Diseases, The US National Heart, Lung, and Blood Institute and the Wellcome Trust. List of participating centres can be found in the paper. The Institute for Molecular Medicine Finland (FIMM) is an international research institute focusing on building a bridge from discovery to medical applications. FIMM investigates molecular mechanisms of disease using genomics and medical systems biology in order to promote human health. FIMM is a multi-disciplinary institute combining high-quality science with unique research cohorts and patient materials, and state-of-the-art technologies.